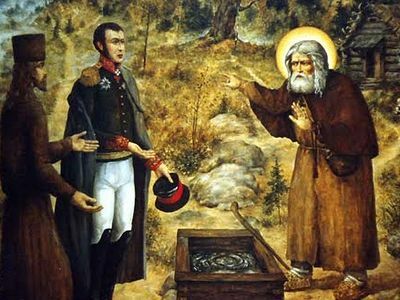 Since the accounts given here were made at the time of the uncovering of the saint's relics, he had not yet been declared a saint by the Church, thus his being referred to as “Blessed.” He was canonized in July of 1903. A small group of people has gathered at St. Seraphim’s spring, and with them is a middle-aged man who is burning a pair of crutches, the crutches without which he was not able to make a single step for more than twenty years. Having been healed by Blessed Seraphim’s prayers, he burns them to rid himself of the memories of so many years of suffering. A family arrives, bringing with them another crippled person, a young woman who has been bed-ridden for eighteen years. The prolonged infirmity has not shaken her faith, and she has placed her hope and faith in that holy man of God who sorrows for the Russian people. At the mere sight of the chapel at the spring, her eyes fill with joy, for she is deeply convinced that the blessed one will help her, and that faith, hard as a diamond will not be disavowed. At the request of her family, she is submerged in the spring three times, and after the third time, the strength returns to her legs and her infirmity is gone! Anna Ilyeva, a widowed cossack woman from Semirchensk arrived at the monastery. She lost her sight nineteen years ago, and lived a life of misery, doing as best she could. After being immersed in the spring, the blindness fell away from her eyes like scales, and anew she could see the beauty of God’s creation shining forth in all its beauty—the handiwork of the Creator and Provider. A young girl from a school for young woman arrives in a carriage at the grace-filled spring with her family. A severe trauma or illness has had a deep effect upon her, and she suffers from fits of hysteria and is a nervous wreck, frightening all around her whenever she suffers an attack. She is immersed into the blessed spring by her family, and according to the testimony given by her sister, she immediately feels significant relief. The attacks of hysteria ceased entirely, allowing the young girl to live her life peacefully. A mother arrived at the hermitage with her small daughter, a meek and delicate child, who is blind. Having hope in Blessed Seraphim, they came with the firm belief that he would intercede with God for them. Arriving at the spring, the child was given some of its water to drink. She drank the water, and behold! Her mother heard these wondrous words: “Mama, mama, I can see you!” The mother began to shake all over with joy! Almost not believing her ears, she cried out, “My precious child, can you really see me?” The little girl answered, “I see you mommy, I see you! You are standing on the left!” “Yes, yes, my beloved, I am on your left!” Glory be to God! A loud commotion could be heard coming from the vicinity of the men’s bath house which was located near the bridge over the holy spring: Two stalwart men were seen holding a struggling, but weak old man under each arm. Despite his near convulsions, they managed to immerse him in the stream three times, getting him thoroughly wet. He let out a yell, and then suddenly stood up straight, no longer needing the assistance of those who had kindly put him into the healing waters. And what a joy! He was completely revitalized, and renewed life flowed into him, a man who just a few minutes before had considered himself almost dead. As he walked about like a young man, torrents of joyful tears poured from his eyes. At first his wife could not believe what she was seeing, and then the reality set in, and then she herself, weeping and weeping, ran and fell at the feet of her beloved husband. All the people who had witnessed this miracle joyfully accompanied the rejoicing elderly couple to the chapel to give thanks to God. Poselyanin further relates: “I had just entered the gates of the monastery, and between the bell tower and the cathedral was a large crowd gathered around an old woman with a little boy at her side. As it turns out, she and the little boy had been healed that very morning. I moved closer to take a better look at the newly-healed boy; he was a lad of about eight or nine years, with bright Intelligent eyes. He was happily jumping and down, an extraordinary look of joy on his face. The boy's name was Peter Ilyich Zobnik, and he was from the village of Bodin in Morshansk. He suffered from scoliosis, and had not walked properly in two years, due to a severe crook in his neck. Recently, the Queen of Heaven had appeared to his mother and said to her, “Take your son to the Elder Seraphim, and he will be made whole.” His family brought him to Sarov, and their first night at the hermitage he cried and cried, finally falling asleep. The next morning, after the early Liturgy, he was taken by his family to the spring and bathed in its waters. Right away he began to shout, “I want to run! I want to run!” He was healed, and his neck was straight, His elderly mother was crying as she related all of this to us. Then the boy, holding her hand, jumped up and down for joy as he looked upon the people and God’s creation. During the last Turkish campaign, a man by the name of Peter Bondarenko had actively served in the army. During a skirmish with the Turks, he had received a head concussion which had left him almost completely blind. Moved by that faith which overlooks advanced years, bodily suffering, and a lengthy journey, he set out from Warsaw for Sarov. It happened that he arrived at the precise moment when the holy relics of the righteous Father Seraphim were being uncovered. After this wonderful occasion, he went to the holy one’s spring a few times to rinse his eyes with its water, and he noticed that after each visit he could see a little better, but as of yet there had not been a complete cure. All the same, the afflicted man did not lose hope, and his faith was soon to be rewarded. 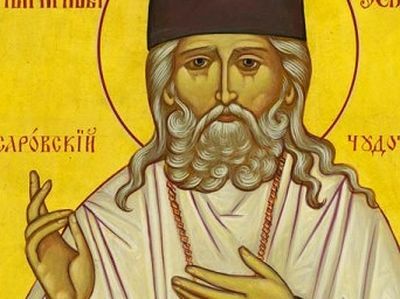 During one of the visits of the afflicted man to the church where the incorrupt relics of the venerable Seraphim had been placed, he prayed with a special fervor to the God-pleasing saint. With permission of the monk in charge, he took out a new handkerchief and placed it on the relics and then wiped his eyes with it. Rushing out of the church, he fell on the ground and with a prayer of gratitude, glorified God and his miracle-working righteous one for receiving healing. He was cured, and now he could see as clearly as in the days of his youth. Another woman had arrived with her small daughter on the day that Father Seraphim’s relics had been uncovered. The little girl was so pathetic; she was very weak, her little legs hung like useless dangling ropes, and the sight of her evoked much pity. When her mother bathed her in the waters of the spring, an amazing miracle took place! The child began to stretch out her little legs, then got up on them and began to walk! Wondrous is God in His saints! On the sixteenth of July before a large number of people, a deaf-mute girl was completely healed. At four o’clock in the afternoon there was a procession with the cross which wended its way around the monastery grounds, and there was truly a multitude of people present. There was an army of people bearing Church banners representing the groups of people from the many towns and cities from all over. One of the holy icons was of the Most Holy Mother of God, “Tender Mercy,” before which Father Seraphim had prayed and reposed, and a large holy portrait of the blessed one were being carried in the procession. When the procession finished, the icon and portrait were carried into the cathedral, and a woman and her child stepped from out of the crowd and venerated the miraculous icon of the pure Virgin Theotokos. As they were on their way out of the church, all of a sudden the little girl cried out the word, “Mama!” Her overjoyed mother told her to repeat what she had just said, and the little girl said, “Mama!” The crowd around them, overwhelmed when they realized what had just taken place, became almost delirious with joy. Money started pouring in from all sides and people put into the girl’s little hands twenty kopek pieces, half rubles, and rubles. So much money came in that it started to fall on the ground. People shouted to the child to lift up the hem of her dress in order that all the money that kept coming and coming could be contained! Her mother kept saying to her, “Say thank you to the people, say thank you!” The crowd kept asking her, “What is your name,” and her mother told her to tell them, “Polya, my name is Polya” [Apollinaria]. During the festive days surrounding the uncovering of the relics of Father Seraphim, huge crowds flowed into the monastery, and one day, so many had come that there was simply not enough bread to feed everybody. One small group of the faithful, tired and very hungry, made their way along the road home, and fell into complaining a little. As they walked along, an old man with a birch bark sack joined their company, and they all struck up a conversation. In time, they stopped to rest, and the old man fed them, enough for them to be quite satisfied. The party then continued along the road, and suddenly it was noticed that their kindly benefactor had disappeared! They began to wonder who this might have been; then, they realized they had been in the company of their beloved Elder, who never refuses a pilgrim either kindness or bread, Blessed Seraphim. It would not be possible to relate here all the miracles that occurred during those holy days in Sarov. From the eyewitness accounts given by people who actually saw them, and officials who confirmed them, telegrams were sent out from Sarov all over the Russian land. At times, the spring was filled to capacity, with as many as ten people entering at a time, and those who were really very ill or were crippled waited their turn with an understandable impatience. The people firmly believed that there was no infirmity from which they might possibly be healed. On the 25th of June, Matrona, nineteen year old daughter of Paraskeva Yevshova, a soldier’s widow, was healed of a severe infirmity at the spring of the venerable Seraphim. Her malady was quite visible, in that she was crippled in all her extremities, especially her arms, which were very crooked. After bathing in the spring, the young woman was able to stand up. All her extremities had been strengthened, and she was able to walk away from the spring. She was from Vetluga in Kostroma. On the 26th of June, Efimia Ivanovna Smolnikova, a peasant woman from Seraput in Viatka, received healing at Father Seraphim’s spring. Having been paralyzed for six years, she felt completely well after being in the spring’s grace-filled waters. On the 27th of June, a school teacher from the public school in Nizhny Novgorod by the name of Andreievsky was healed. He had contracted malaria on the 10th of the same month. On the 28th of June, Matrona Nikitevna Kulomzina, a twenty-five year old peasant woman from the village of Korovenka in the Tula Province was healed at the chapel over the grave of Father Seraphim. She regained her sight after having lost it five years earlier. On the same day, a novice from the Kutuzov convent in the diocese of Nizhegorod received healing at the well from severe pneumonia for several months. The novice was a fifty-two year old woman by the name of Anastasia. On the 3rd of July, during the transfer of the relics of the venerable Seraphim from his grave into the church of Sts. Sabbatius and Zosima, Paraskeva Vasilievna Bochalova received healing from a severe case of epilepsy, from which she had suffered for more than twenty-five years. She was a peasant woman from Kalyazin district in the province of Tver. On the 4th of July, Anna Timofeievna Lovetskaya was cured from a three year bout of rheumatism at venerable Seraphim’s spring. She was a peasant woman from the village of Novospassky in the Tambov Province. On the same day, Ekaterina Yegorovna Khudisova, twenty-two years of age, was given back her sight, which she had lost eight months earlier. She was a cossack woman from the Chamlysky district in Kuban. On the 4th of July, Anna Nikiforevna Anashustikova was also healed of rheumatism in the legs, from which she had suffered for many years, at the graveside of the saint. She was from Ostrog in Voronezh. Also on this day, Natalia Dorofeievna Varnovkova was healed of migraine headaches, from which she had suffered for more than ten years. She was a peasant woman from the village of Panoki in the Province of Penza. Elizaveta Gazochkina, a peasant woman from Kazan, was healed by the prayers of God’s holy one, after having suffered for years from shingles. Having made a vow to make a pilgrimage, she was healed on her way to the monastery. On the 11th and 12th of July, the following healings occurred at Father Seraphim’s spring: Agrafrafina Shilokova, a peasant woman from Penza province, had for over ten years suffered from various stomach ailments. Treatment by various doctors had proved useless. Arriving at the spring, she drank some water from it, and at that moment she received total relief. A huge tumor had been growing on the neck of Mikhail Saveliev-Tyufkin, a young man of only twenty-three. The tumor prevented him from turning to the side, and it caused him great pain. After visiting the spring, the tumor disappeared, and he was able to move his neck. He was from the village of Nikolsky in Slobodsky. Anna Timofeievna Svechkova, a peasant woman from the Kvalnisky area of the Saratov Province had been unable to walk for four years. Having bathed in the spring, she began to walk, though very slowly, and no longer needed crutches. On the 12th of June was the notable healing of a dumb peasant woman by the name of Paraskeva Sergeievna Klemnova from Alfereva in the Samara Province. According to her own words, she had lost her speech on the 5th of February. Having bathed in the spring, she was again able to speak. On the 14th of July, the healing of an eighteen-year-old woman by the name of Agripina Elizarova took place. By her own account, she had lost her sight at the age of live. Having been led to the spring by her relatives, she drank of its waters and rinsed her eyes with it. As soon as she did this, she started to see, but at first it was as if she was in some sort of a fog. By evening, she was able to differentiate between objects. She was from the Ardatovsky area in the Simbirsk Province. The forty-year-old native of Putyatin in Ryazan, Riassophore Nun Natalia (Mikhailovna Pushkina), a novice at the Seraphimo-Diveevo convent, suffered terribly from emaciating hemorrhaging for more than seven years. Gaining no help from physicians, she set out by foot on a journey to the Seraphimo-Pontayevsky monastery. There she prayed fervently and with great zeal before the icon of the Holy Theotokos of the Sign and she received healing from her infirmity. Alas, soon afterward, Sister Natalia again became ill; a tumor appeared in her stomach, which continued to grow larger over a period of five years. Sister Natalia suffered terribly from her new infirmity, walking with great difficulty and finding bending over exceptionally painful. When attempting to move, she felt overheated, and was constantly thirsty. Medication brought no relief, and her physicians assured her that an operation would mean sure death. She had only one hope—in God. Another three years passed, and Sister Natalia continued to suffer. The time was quick approaching for the glorification of the God-pleasing Seraphim. From everywhere there were reports of healing taking place at his graveside and at his spring. Sister Natalia, filled with the sure faith of receiving aid from the holy Elder Seraphim, decided to go to Sarov. An elderly nun by the name of Mother Fevronia decided to go with her, and with great difficulty, they walked the twelve-verst distance between their convent and Sarov monastery. Arriving at the monastery, both nuns went to confession, and then set off for the grave of Batiushka Seraphim. There, Sister Natalia with great zeal tearfully beseeched the saint to grant her healing. When they finished praying, the fellow travelers went to the guesthouse to spend the night. At one o’clock in the morning, Sister Natalia heard someone opening the door to their room and walk in. Thinking that Mother Fevronia might have gotten up during the night, had returned and forgotten to lock the door, and that a novice had entered to wake them for Matins, she covered her head with a blanket. But then, she felt someone touching her on the shoulder and saying to her, “You have come to the wretched Seraphim to be healed; bathe three times in my spring, and it will come to pass for you.” Then she heard the sound of footsteps leaving the room. Throwing back her blanket, she could see a light or glow surrounding her, and began to weep. Hearing her sobbing, Mother Fevronia listened to the story of the miraculous visitation. Checking the door, she found it still locked, and it was at that moment that Sister Natalia understood that she had been visited by Father Seraphim. The two nuns arose, got dressed, and went to Matins. They remained through the entire service, and then attended the panikhida at the grave of the great elder. During the panikhida, the sick woman prayed fervently and tearfully. After the service, the pilgrims made their way to the holy spring. On the path to the spring, Sister Natalia had the sensation that her tumor had collapsed, and she began to bleed. She had to force herself to go on, but having made it, she bathed in the waters of the spring. At four o’clock that afternoon, she went to the spring to bathe again. She awoke in the middle of the next night and she felt that the tumor was gone. Nothing hurt inside, and it was as if she had been born again. Waking her traveling companion, she tearfully and joyfully told her what happened. At four o’clock in the morning, she arose and bathed in the spring once more. After this, she felt like a new person; her infirmity had disappeared without a trace. In January of this year, 1903, there was an amazing occurrence. Paraskeva Ivanovna Kiselyova, a peasant girl from Veryanovna in Ardatsky fell severely ill for two years. She lost the use of her legs, and her condition was so bad that she could not only not walk, but she could not even lie down. To add to her misery, she also couldn’t raise her arms. The girl spent almost all her time on a peasant stove, only now and again being driven to her grandmother’s house on a sled. For a long time she had a great desire to go to Father Seraphim’s grave, but had to put her wish aside, because her father did not own a horse. At the end of January of this year, the girl had been taken to her grandmother’s house where she was to spend the night. During the night the girl had a dream in which an oId man of noble appearance entered the peasant hut. Walking up to the stove where she had been sleeping, he said to her, “This is the third time that you have intended to travel to Sarov see the wretched Seraphim, but still you have not come!” Paraskeva answered the holy one that she had no money for the trip. The elder told her, “Sell the cloth that you recently purchased, and come with the money you will receive from its sale. Bathe in my spring, and you will become healthy. And by the way, buy two five-kopek prosphoras—eat one, and save one until Clean Monday.” At these words, the Elder Seraphim vanished. The girl woke up and told her grandmother all that had happened. Her mother procured a horse and sleigh and took her to Sarov. On the journey, the girl’s grandmother was preoccupied with how she was going to get her out of the sleigh. To her amazement, when they arrived at Sarov, the girl got out of the sleigh and went straight to the church. Afterwards, she went to the spring and bathed and was completely healed; now she can walk freely and has the use of her arms. Having returned home, Paraskeva again saw Venerable Seraphim in a dream, in which he blessed her with his cross. How wondrous are the manifestations of God’s mercy by the prayers of St. Seraphim! The frequency of healing from incurable illness has caused even the incalcitrant schismatic Old Believers to waver a bit. They have been moved, and in some cases their hardened hearts have been softened, being compelled to turn to the grace-filled God-pleaser Seraphim, and to enter into the bosom of the Orthodox Church. Daria Yermilova was a sixty-year-old, vehement schismatic from the Nikolsky region in the Samara Province. She decided to go to Sarov, arriving in July. She regularly went to the spring of God’s blessed one. Seeing the multitude of healings, she came to understand the deception of the doctrine of the schismatics. With bitter tears she repented, and decided to unite herself to the bosom of the Orthodox Church. Seeking help, she was advised by the local diocesan authorities that the highly esteemed cleric Archpriest I. G. Zvezdinsky would soon arrive at Sarov from Moscow. Fr. Zvezdensky had united nearly 2,000 Old Believers to the Orthodox Church during his term as rector of the Church of the Entry of the Theotokos in Moscow. With great joy did he accept to instruct Yermilova in the truths of Orthodoxy, and being convinced of her sincere conversion, united her to the Orthodox Church on Monday July 14th in the monastery church. By God’s mercy, she was able to receive the Holy Mysteries that very day! Before her acceptance to Orthodoxy Daria Yermilova had been very influential among the Old Believers, and her conversion came as a great shock to her former co-adherents. On the 18th, the eve of the opening of the precious relics of Father Seraphim, all the peasants of the village of Stepurin in the Bogorodsky region decided at a parish gathering that they would not work that day in the fields. They were all in agreement to do so, except the Old Believer, Sitnov. Sitnov began to heap scorn upon the venerable one, saying that he would intentionally send his workers out to work the fields that day. He continued to blaspheme Father Seraphim, and when he was at his worst, he suddenly staggered and fell. Those around him rushed over to help him, but he had been struck dead. A reverent fear overcame all of the peasants, and news of the incident spread throughout the surrounding villages. Local Old Believers, troubled by the death of Sitnov, decided to abstain from working on the 18th of July. Here is another account. On that same day, the 18th, an unconscious man who worked at the train depot “Harkov” of the Kursk-Harkov-Sevastopol railroad was admitted to the Harkov railroad hospital. The worker, a peasant named Tur, aged twenty-seven, was diagnosed as being totally paralyzed in the entire right side of his body. Tur’s friends said that earlier that day they had been talking to him about the venerable Seraphim of Sarov, and Tur made it quite clear that he did not believe in the sanctity of the God-pleaser. According to the account given by his со-workers, it was at that point that he was unable to finish what he was saying, fainted, and lost consciousness. He was then rushed to the hospital. The word had gone out from person to person throughout the whole of Russia recounting all the miracles that took place in Sarov. The God-pleaser is merciful to all who reverently venerate his memory; those with fervent faith and firm hope run to him for aid. But terrible is the judgement upon those who, having closed their eyes and only do not wish to believe, but do not want to believe in God’s saint. In their wicked blindness they even make bold to blaspheme the righteous one and scoff at his sanctity! Glorified is God in the deeds of His Saints! 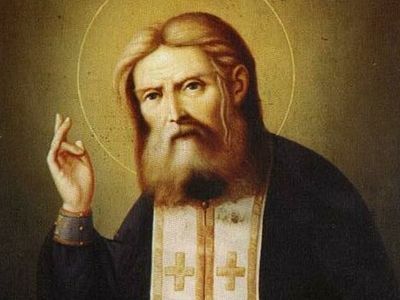 Having led a heavenly life on earth, like the great desert saints of antiquity, even in these latter times of spiritual desolation, St. Seraphim is an instructor and an inspirer of the true Christian life. His Spiritual Instructions—like his celebrated Conversation with Motovilov on the Acquisition of the Holy Spirit—contain no new teaching, but simply repeat in modern times the age-old Christian teaching of the great Fathers whom he constantly cites: Sts. Basil the Great, Gregory the Theologian, John Chrysostom, Macarius the Great, Dionysius the Areopagite, Ambrose of Milan, Isaac the Syrian, Symeon the New Theologian, the Fathers of the Philokalia.